LINDSAY – Out of four candidates running for two seats on the Lindsay Hospital District Board, only one has be responsive. 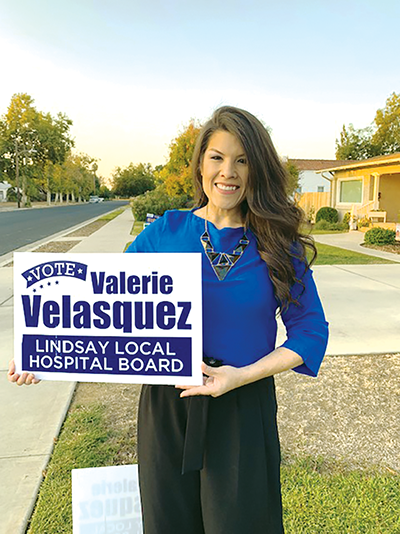 Valerie Velasquez is taking on incumbent Rick Loftin, and other challengers Elizabeth Waggoner and Ignacio Alcocer. Cynthia Baker, incumbent on the board, did not file for reelection. Velasquez was the sole candidate who was inclined to answer the Sun-Gazette’s questionnaire for publication. Alcocer fervently refused to respond to questions, Waggoner failed to provide updated contact information and Loftin did not respond by press time. • What are your qualifications for running for this office? • What do you see as the main issue facing the hospital district? • What is the primary role of the hospital district in Lindsay? • In addition to what the district funds now, what types of projects would you like to see the hospital district support?